We’re pretty sure there’s not a person alive on this Earth who’s never heard of Google. The internet platform has become the leading search engine in the world, setting the standards and raising the bar for digital technology algorithms. Google has since embarked on speech recognition technology which utilizes the concepts behind closed captioning and video transcripts. At Verbit, having taken Googles improvements into close consideration, we’ve compiled a list of ways to beat their speech recognition technology by doing it ourselves for our own models. We are helping companies with their speech recognition needs and training their exact audio data with our proprietary transcription technology. While companies would buy generic data models from Fisher or others, we can impact the models with the customer’s own data. The way that we do it is through a mix of technology and people. At Verbit, we pride ourselves on having built an adaptive ASR (Automated Speech Recognition) technology to recognize all types of human voices, even with low quality audio and confusing terminology. Our proprietary ASR which is furthermore specifically trained for the domain of the customer, through the use of Artificial intelligence – something we at Verbit use to our advantage. 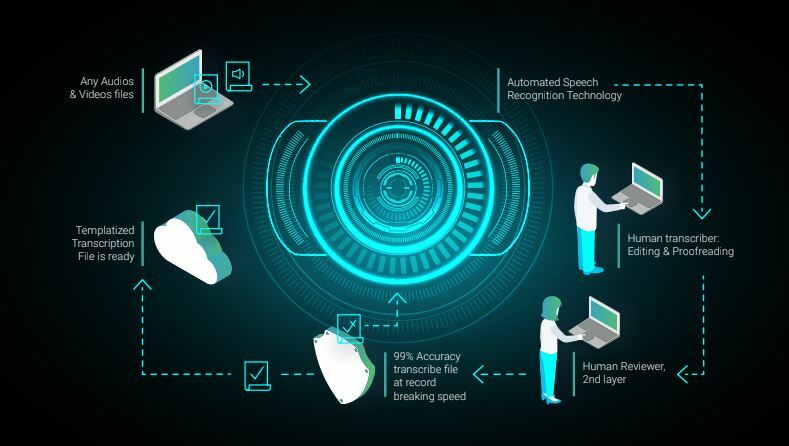 Proprietary ASR (Automated Speech Recognition) Technology– the process defined above. This layer is highly accurate creating (87%-95%) transcribed jobs in a matter of minutes. The transcript is then passed on to the editors and reviewers. Here they aim to ensure that the transcript becomes a error free transcript with more than +99% accuracy. The final layer is the assessment stage which is done in order to oversee any evident errors using AI. It’s also in this layer where the content is trained for new contexts and different accents. By using a three layer loop process in Verbit’s voice recognition process, the accuracy and efficiency are always improving, as we are utilizing our own data to improve our acoustic algorithms. The hybrid model also makes for a excellent customer experience in that we are able to manage, monitor, and modify jobs in a timely yet effective manner. Pricing, accuracy, and turnaround time has become Verbit’s significant benchmark and we use this as a platform to beat competitors such as Google in speech recognition technology.